Cooking up delicious, smoked foods can be incredibly rewarding. And it doesn’t have to mean buying an expensive standalone smoker either! A smoker box to use on your existing grill can do the trick just as well. When it comes to choosing the best smoker box for gas grills, not all are created equal, and various factors should be taken into account to ensure you choose the right one for you and your grill. In this article, we walk you through the buying process, to ensure you end up with a quality product that will help you to achieve great results and smoky goodness. Are Smoker Boxes for Gas Grills Only? 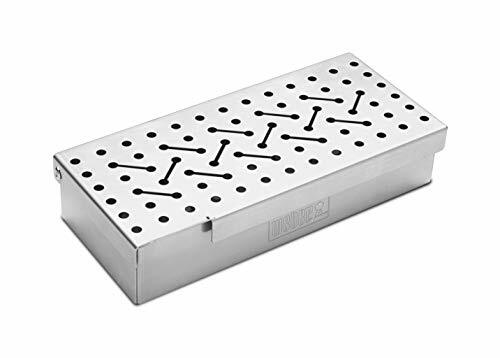 It’s a box used to produce smoke from smoldering wood chips, generally speaking they used to turn a gas grill into a smoker, though they can also be used charcoal grills. A smoker box can be used in conjunction with pretty much any existing gas grill and is a cheap and effective way to get great smoky flavor from a product not particularly designed for the task. It saves you from having to buy a second piece of equipment just to add smoky flavor to your food. Not at all! You can use them with charcoal grills and many models of electric grills, too. They are simply a means of producing smoke from wood chips in a controlled way. Something that’s incredibly hard to achieve by throwing wood chips straight onto flames or coals. Although most smoker boxes look very similar, some degree of selectivity is needed, to make sure you get just the right one for your requirements. Considering the lid, the ventilation, the model, and how easy it is to clean – among other factors – means you’ll end up with an awesome product that suits your needs perfectly. You’ll want to look for a smoker box made from thick and durable material. The box will be heated many times, so it’s important to watch out for and avoid cheap ones with poor build quality that are prone to warping and discoloring easily. Many models are made of stainless steel, most of which contain chromium, forming a self-healing, protective outer layer. Further on in this article, we also review a cast iron version. The latter might take longer to heat up, but once it does, it stays hot for longer. It will also smoke foods quicker after a refill of wood chips than a stainless-steel model. Smoker boxes are often situated under food, which will drip fat onto them, so an easy clean model is a bonus. 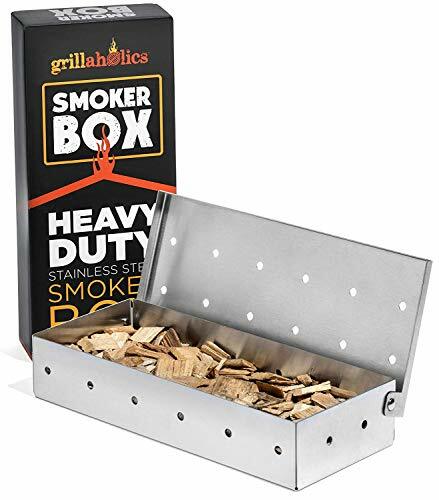 You want the smoker box to be big enough to allow for a reasonable volume of wood chips, otherwise it won’t smoke for long and will need constant refilling. As grill aficionados say, “When you’re looking, you ain’t cooking!” The lid should be closed as much as possible so that the heat and smoke stay inside, so having a sizable smoke box that needs refilling less often is a good thing. It’s important that the lid fits very well, but is also easy to open. If the lid is loose and too much air gets inside, the wood chips might burn with a flame. This makes them burn quickly instead of smoking from a slow smolder. Wood with a burning flame produces very little smoke, so you want a flameless smolder to achieve a good smoke output and to impart some flavor. The smoker boxes we’ve listed below are some of the best available on the market today. This model is incredibly easy to use. It’s also very durable, with 25-percent thicker stainless steel, making the possibility of it warping much less likely than with comparable products. Another bonus to that super thick layer of stainless steel is that it decreases the possibility of discoloring. 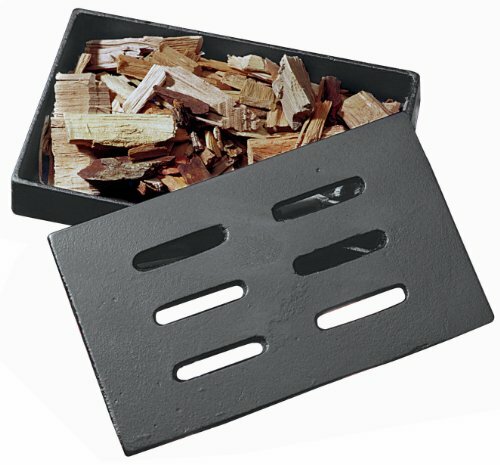 The hinged lid of the smoker box easily permits adding in a large number of wood chips. You’ll avoid having to refill often and be able to keep the lid closed for a longer period. This capacity is also great because more chips mean a lot more smoke for your meat. If you’re someone who can’t stand handling hot objects, you’ll like the lid, which allows accessibility with complete ease, making accidents and burns unlikely. It also comes with free, downloadable access to a BBQ smoking & cooking journal app, which is compatible with iOS & Android. The app has 25 mouthwatering recipes with step-by-step instructions. Affordable price point and good value for money. Ideal size whether you place it between flavorizer bars or on top of the charcoal. Since there are no holes at the bottom, the chips smolder instead of burning and are unlikely to catch fire. Lifetime guarantee. If you’re unhappy with the product at any point, you get a full refund. Although this is hard to believe, we really cannot find anything bad to sya about to say about this product. It does what it needs to do and does it well. The Cave Tools smoker box is pretty easy to use. The manufacturer recommends not soaking the wood chips first and, instead, placing them in while they’re dry. For best results, keep it within reasonable proximity of the heat source and turn the burners to the highest heat until it starts producing smoke. After that, you can bring the grill down to regular cooking temperature. Available in two different sizes, this product from Charcoal Companion is constructed in a V-shape, so it easily fits between the flavorizer bars of gas grills and allows for optimum heat exposure, generating tons of smoke. Its versatile shape also makes it compatible with a variety of smokers and grills. 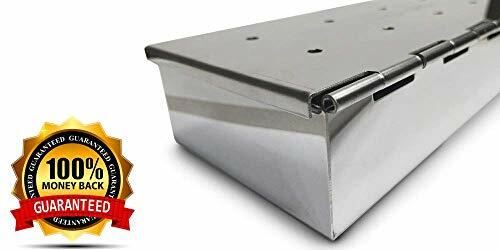 This smoke box is developed particularly for gas grills, which are a popular choice because of their convenience. Similarly to the Cave Tools product above, it comes with a hinged lid that allows you to easily add in flavored wood chips of your choice. The Charcoal Companion is also a great choice for anyone who doesn’t particularly enjoy cleanup. The way it’s designed, ashes fall to the bottom of the smoker box as you cook. As all residue remains in the box, all you need to do for cleanup is empty the box after cooking and wipe it over. The hinged lid allows for easy access to the wood chips, making it super simple to add more without pausing the cooking process. Unique V-shape allows for an easy buildup of smoke. Some users say it rusts quickly, making it a less durable option than other smoker boxes. Since the box is not particularly large, you might not be able to fit a large number of wood chips inside it, which means you’ll waste time refilling during cooking. The Grillaholics smoker box is simple to use. Getting started, all you need to do is insert your favorite flavored dry wood chips inside the device. Then, place it as close as possible to the flame, while you kick back and wait for the meat to cook. Suitable for gas and charcoal grills alike, this product comes with a promise from Grillaholics that it will up your BBQ game. At a slightly higher price point than some other options in this list, it’s probably well worth the extra few bucks given the large number of wood chips that fit in it. Pretty convenient setup and size make it easy to use on a grill, without the limitations that come with using a larger smoker. The Grillaholics brand is committed to making the outdoor cooking lifestyle enjoyable, even for a novice, and its products are some of the finest grilling accessories out there. Dimensions are 8.8 x 3.8 x 1.8 inches. Compatible with most types of grills. 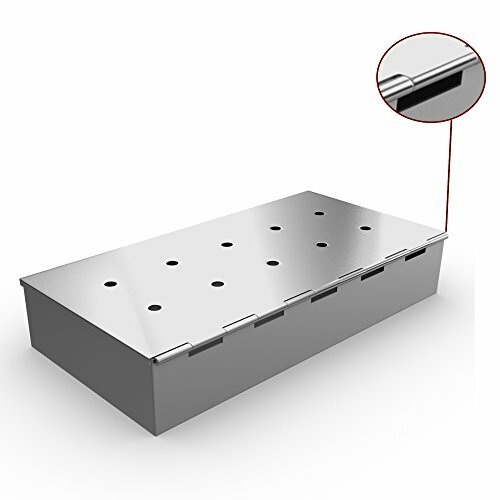 Numerous holes on the product’s surfaces allow for optimum ventilation, making the heat level consistent. Comes with instructions to access the Grillaholics VIP club, a like-minded community interested in outdoor cooking. Large wood chip capacity keeps the smoke burning for longer, eliminating the need for constant refilling. Some users complain that the lid warps and discolors. Another strong, durable smoker, the Grillaholics smoker box is designed to make your grilling experience all the more enjoyable. Wood chips might take as long as 15 minutes to start smoking, which is a bit of a longer window than the other boxes on our list. A somewhat small and compact product, the Gifty Chef smoker box fits the majority of charcoal and gas grills on the market. This smoker is also made of durable, premium materials. It comes with four recipes, to get you started as soon as possible. Whether you’re planning small, camping barbecues or grilling for a more enthusiastic crowd, the Gifty Chef box is a good choice. The smoker’s size speeds up the smoking process and reduces flame intrusion. Just make sure it’s close to the heat source while you’re cooking, to instantly add that smoky, mouth-watering flavor to your BBQ meals. Dimensions are 9.4 x 4 x 2 inches. 100 percent, no-risk, customer satisfaction guarantee or your money back. Nice packaging makes it a decent gift idea. Comes with 4 Quick ‘n’ Easy recipes to get you smoking right away. Hinged lid makes it easy to add in wooden chips. The holes on the product’s surface are less substantial and prominent than on some other smokers. This means less ventilation and likely less smoke. According to the manufacturer, this tried-and-tested product was created after extensive research into some of the most common issues people face when smoking foods. The only product listed here that isn’t stainless steel, the Char-Broil cast iron smoker is specifically designed so that it stays hot for longer, even if it does take a while to heat up initially. It can also withstand higher grill temperatures better than comparable products. Its large, vented lid design allows smoke to be closely directed toward the food for just the right amount of flavor and heat. A significantly durable smoker, the cast iron is an entire quarter-inch thick. The wood chips smolder inside and are unlikely to burn, as smoke is vented from the lid. The product does require some upkeep at the start if you want it to last. The manufacturer recommends seasoning it by coating the smoke box with oil the first time you use it. Repeating this process after the first couple of times using the product will make it so well-seasoned that rust is unlikely. Dimensions are 1.4 x 5.1 x 8.1 inches. A versatile product, it works well with most types of grills. Wood chips are unlikely to catch fire given the sturdy iron make. Vented design allows more smoke to reach the roast. The double cast iron body and lid make this smoker one of the most durable. This smoker’s weight and thickness might make it awkward to carry around. Traditional lid structure makes it difficult to add extra wood chips in if needed. Some prep required before first use, to avoid rust developing. A great product for adding real smoky flavor to your next BBQ meal, this Char-Broil cast iron smoker box suits different type of grills, including gas, charcoal, and electric. It’s also great with a range of dishes. The longer, vented holes at the top allow for smoke release into the food without the mess. Made of durable stainless steel, this product is one of the more enjoyable and user-friendly smoker boxes. Like many of those featured here, it comes with a hinged lid, which simplifies the process of adding in extra wood chips while the roast is smoking. A little pricier than some of the others, this is a Weber brand smoker that’s compatible with the grills from the same brand. Fitting many size grills, the Weber smoker box is a great accessory, whether you’re cooking meats, veggies, or more. As a plus, the company website also offers a few tips on the process. Dimensions are 9.8 x 4.5 x 2 inches. Effective surface hole design oozes smoke generously. Easy clean-up after every cook. All you need to do is empty the box of any excess ash, and then it will be ready to cook with once again. Very easy-to-use hinged lid makes adding chips in a breeze. The durable stainless steel makes the product great for consistent use. 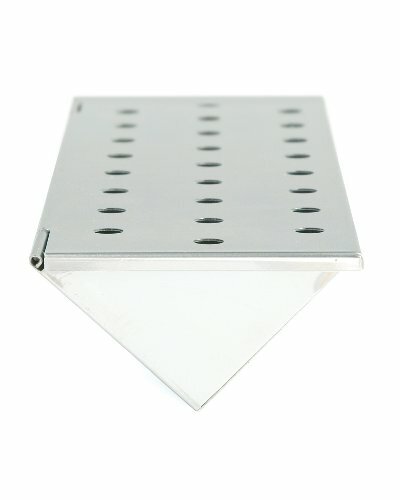 Asides from the fancy look on the surface, with the unique, widespread hole arrangement, this product is certainly one of the more attractive ones in the market. We’d recommend taking a look here to learn more. It’s a straightforward process to get that smoky flavor on your barbecue. Weber Grills has a few pointers to start off with, and Chef Tips also has a great video guide on using a smoker box. The smoking process should, ideally, only take up a portion of your cooking time, because once meat has reached a certain temperature it stops taking on any more smoke. Therefore it’s important to get the smoke rolling before you place your meat on the grill, and while the meat is still cold. Also, you should only see white smoke gently drifting up out of your grill. If the smoke is thick and billowy, or even worse if it’s black, then there’s something not right! Place the smoke box on the grill and allow it to heat with the barbecue. Slowly remove or turn (if it’s hinged) the lid away from the box using kitchen tongs. Close the lid of the barbecue so the heating process of the wood chips begins. Wait a few minutes for the temperature to rise inside, and wait to see visible signs of smoke before opening the grill again. With the first sign of smoke, you can now oipen the grill and place any meat and foods on the grill that you wish to give a smoky flavor. Close the barbecue once again and cooik as normal, while getting ready to taste the difference as the smoky flavor builds. Once you’re done, you’re ready to enjoy a mouthwatering BBQ meal. Choosing the right smoker box can go a long way toward helping you cook a great BBQ meal. When you turn your grill into a smoker, the flavors you can get are infinitely better than with a regular grill! Whichever type you go for, you want to make sure you select a durable product that works well. And check out the lid design and don’t forget to make sure that the box you’re choosing will be compatible with your grill. If you’ve already tried a smoker box, let us know in the comments section how you got on?. And If you have any questions, please do ask below, we promise to answer every one.